Wake every morning to 180 degree views of the ocean and end the day with spectacular unobstructed sunsets. Seacruise villa is situated on the north-west coast of Barbados and has a private swimming pool plus a cozy dip pool/spa. All bedrooms with en suite bathrooms. Fully air conditioned villa with ceiling fans, cable TV, free High Speed wireless internet, beach access, daily villa staff , use of the villa car for a small fee. and Complimentary transfer to and from the airport (one group each way). The View is just fantastic ! ( sea and west coast) and you will never get enough. 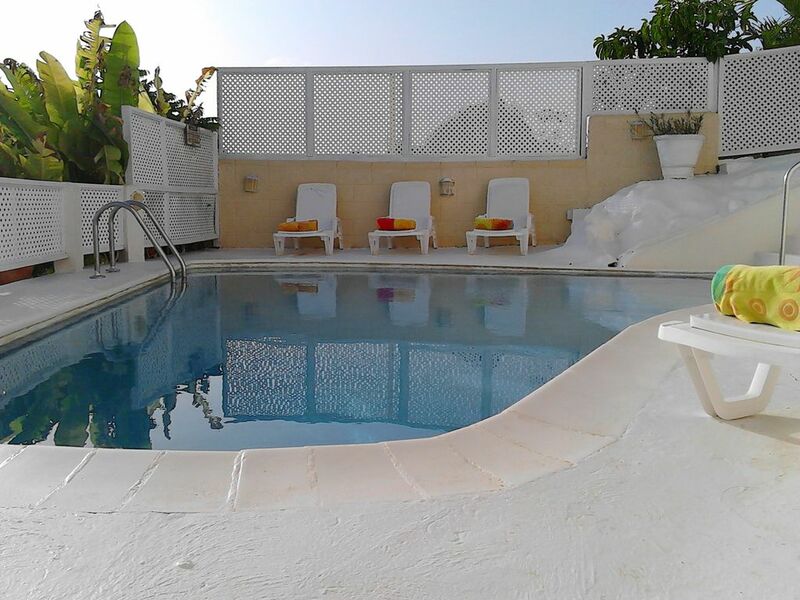 The villa is located in the quiet and peaceful Fryers Well. The white sandy Fryers Well beach is a leisurely 3- 4 minutes Walk. From the foyer and throughout the villa, the tropical decor and the open air living plan makes one feel relaxed and ready to enjoy the tranquillity. The 'Reflection room', is an ideal conversation area and this flows into the living room with its furniture to suit the taste of all our treasured guests. Just take a few steps on to the patio with its strategically positioned dip pool /spa to experience that memorable view. At night, the twinkling of the coastal lights and stars add the finishing touches to your day. Laze on the deck of the outdoor swimming pool and capture an even more enchanting view of the west coast. The bedrooms are all different in varying Caribbean themes and are situated on the first floor for you to fully capture the magical ocean and coastal view. The bedrooms are fitted with robes, toiletries, linens, a/c ceiling fans and their own private balconies . The 'FANTASY'suite has a king size bed, a jacuzzi, and a walk in closet. Concealed lights shining onto the high vaulted ceiling add a touch of elegance. The 'STATE' suite also has a king size bed,a jacuzzi,walk in closet and a marble vanity. The'CARIBBEAN'suite houses a queen size bed and a cleverly positioned walk through closet leading to its sunken bath. The'TROPICAL' suite,with its vibrant colours,has two twin beds and a Cleopatra vanity. The 'SOFA' suite has two twin beds. The beautiful mahogany furnishings is a favorite. Dining still offers the spectacular panoramic views from the main dining room. The choice is yours to use the patio for outdoor romantic dining. The second largest town with great historical intrigues, Speightstown ( formerly little Bristol is just 3 miles away. It offers fine shopping and a number of fine restaurants and Art galleries . Supermarkets are well stocked and you can obtain from the fish market a wide variety of seafood to satisfy your taste. The chef can assist with obtaining your choices- allowing you to relax. Seacruise is an experience for you to enjoy - a relaxing, peaceful and memorable vacation - the villa's design allows privacy for couples and honeymooners and for retreats, reunions of friends, family and business associates. Upgrading the outdoor Pool has recently been completed as we strive to maintain a minted look. Our staff pride themselves on Service with a smile. AMERICAN - daily from Miami. JET BLUE - daily from Fortlauderdale. New York. BRITISH AIRWAYS and VIRGIN ATLANTIC 747 - from London and Europe. AIR CANADA and WEST JET - from Canada. Caribbean Airways from New York and Miami. Liat from the Caribbean Islands. You are met outside the arrival hall of our airport [ Grantley Adams Airport / BGI ] and transported (complimentary)to the villa. At the end of your stay we offer free transfer to the airport. The owners took great care in choosing the perfect location for the villa - a quaint area on the north-west coast of the island so as to experience the Caribbean Sea, but also to experience the quiet, friendly relaxed Barbadian village life. The proximity to the beach and the spectacular view of the ocean from the villa led them to choose the name ‘Seacruise'. Seacruise villa enjoys a panoramic view of the west coast.The view along with serenity and relaxation will always be the capture point of this villa. Experience uninterrupted 180 degree views of the ocean and west coastline, and also capture those colourful daily sunsets. The villa is designed for you to be aware of the nearby ocean at all times as it offers selective ocean views from each room. Even though fully air-conditioned, the coral stone walls, porcelain tiles and the French doors opening onto the patios gives you the option of also enjoying an open living plan in a cool atmosphere with the refreshing sea breeze flowing throughout. Keep in touch with your complimentary high speed WiFi and cable television. Total relaxation with no household chores . Why? Daily villa staff - chef, housekeeper, laundress and pool attendant. Option of a dip pool on the patio ( ideal for small children ) or swim in the outdoor pool. Spectacular views from both. All bedrooms have en suite bathrooms. Each bathroom has a portable hair dryer, 'comfort' robes, towels, shampoo and soaps. The villa is fully air-conditioned - split systems. Washing machine is exclusive to the villa. Clothes dryer is exclusive to the villa. There is complimentary high speed WiFi. Bring your lap top. Bath, beach, pool and kitchen towels are provided. There is an exercise bicycle. The living is open living, flowing onto the patio. There is entertainment with your plasma television. There are 2 refrigerators One has an ice dispenser and a filtered water dispenser. Dishes and utensils are provided. The main dining room seats 10. There is also dining on the patio. There is a portable radio and CD player. We have some novels for you to browse through. There are board games for adults and children. There are pool and beach toys. A variety of tropical plants including local ginger lilies and heliconias. The view is spectacular. Each bedroom has a balcony with its own individual view of the ocean. Boat cruises can be arranged. Water sports gear can be obtained from the nearby water sports company. Tennis can be arranged at a nearby hotel for a fee. Sandy Land golf Club and Barbados Golf Club await your challenge. Your outdoor and patio spa/dip pool are private and exclusive to the villa. The Jacuzzi in the Fantasy and State suite is heated. The staff work daily. You provide the groceries your desire and the chef will prepare breakfast, lunch and dinner. A butler is optional. The housekeeper / laundress will maintain the villa and prepare and clean the guest laundry. The private dip pool / spa is conveniently located on the spacious patio for you to enjoy the magnificant view while you soak in the sun. From your private outdoor pool deck, you can continue to enjoy the awesome, refreshing coastal view. The property was absolutely breathtaking. From the views to the chef to the housekeeping everything was perfect. We all really enjoyed ourselves and are already planning our next vacation to come back. Thank you to everyone especially Dorothy for your help in making this the most perfect vacation ever!! Can't wait to see you all again. It was a pleasure hosting you and we hope to have the opportunity of hosting you again. I joined my husband, two other couples and one baby on a trip to Barbados for a conference. While our husbands were attending the conference, the other wives and I looked forward to the kind of vacation where we did things at our own pace whenever we felt like it. Sea Cruise provides just that. We got in quite late at night and the staff was there waiting to greet us and welcome us to the villa. Dinner had been prepared in anticipation of our arrival including a special request of Cou Cou which was requested that very same day. It was delicious, Cecelia's cooking is excellent. As the gentlemen were attending a conference and the ladies and one baby were on holiday, we were on two different schedules. The staff made every effort to accommodate our schedules making sure we were adequately fed, pampered and taken care of. I especially liked that our laundry was taken care of. I hate returning from vacation with a suitcase full of laundry that I now have to do, not fun. The villa comes with a car which allowed us to explore the island of Barbados but we also enjoyed just relaxing at the villa. Relaxing in the pool, walking to and swimming in the nearby beach, a late night dip in the plunge pool. The personalized service is what stood out to me about Sea Cruise. I would definitely stay there again. P.S. I highly recommend Cecelia's homemade tartar sauce, it's scrumptious. Its refreshing when people say "good morning"
This was the worst experience, dogs barking, no beach to speak of, path to the so called beach was pitted and garbage by the side of the road. Our group has rented beautiful villas in Jamaica, Manzanillo and Europe .. this was our first disappointment. It is far from everything.. My husband wanted to play tennis and had to take a bus and pay to spend the day at a resort to do so. There were 8 of us and they gave us a car for 5, . The deposit was paid for with a credit card, then for final payment owners insisted on wiring of money. The only good thing was the cook but the other help did not do a good job. The bar-b-que was rusted, the kitchen cabinets were dirty and all in all beware. I told the owners and they took the book you write comments in away. Area around the pool is narrow and furniture is cheap. One of our party slipped and fell because of the conditions. I wish someone had left a review we could have relied on. Owners are uncooperative, we were the last to arrive and there was no food for us until 2:30 the next day. No staples in the kitchen but salt and pepper. hope this helps stop someone else from making the mistake we did. Beaches in Barbados are all public. There are no private beaches in the island and therefore no private beach assigned to the villa. The pathway to the beach is also public. In the month of January, the island has been experiencing some high seas and there have been weather advisories informing residents and visitors to refrain from using the beaches / sea. Guest at the villa are offered, if they desire, the use of the villa car which accommodates 5 persons and is not a rental car. For large groups, it is also suggested to the head of the group to rent a vehicle to comfortably accommodate the numbers in their group. This suggestion was declined by the head of this rental group and for their entire rental period, they did not rent a vehicle. The villa is not and is not advertised as an all inclusive villa. There is therefore no food stocked or bought for use at the villa without the head of the rental group's request. The villa however offers before arrival, a starter grocery list to the head of the rental group. This allows the head of the rental group to choose and / or add what food and grocery items they would like stocked at the villa for arrival and the following day. This saves the group from having to rush to the supermarket soon after arrival. The head of the rental group however seemed to have chosen the minimum of food items but a substantial amount of alcohol beverages. The arrival dinner menu which was requested by the head of the rental party was prepared for the group by the cook and served. Th villa offers daily staff services - daily cook, daily maid, daily laundress and daily pool attendant. The daily laundress cleans both the villa and guest laundry. Our last visit was in November 2010. We have booked to return in July 2011. The Staff was very courteous and made us feel at home. Pat was great with the food. The villa was kept in a very immaculate condition and was tided twice per day. In Summer the beach was great but in late Dec thru June the locals told us it was smaller but still very nice to swim and snorkel. You do need a car as it is seven minutes from Speightstown [with supermarket and a few shops]. The area is typical Bajan village with very friendly people. We have been to Barbados over ten times and over 80% of the villae are located in small village like areas . We enjoyed it but not as much as that of SEACRUISE. Of course if one does not want to be in an area of the native people then Sandy Lane or Royal Westmoreland is perfect. Our group of 10 stayed at Seacruise Villa to celebrate a 20th wedding anniversary. Only the "bridal" couple had been to Barbados before so the rest of us didn't know what to expect. We were blown away with the Villa and all it had to offer. It was everything the website said and more! The Staff - Pat, Olive and Vileta - were exceptional. Olive and Vileta kept the villa spotlessly clean including doing our laundry for us daily! And Pat was wonderful - her meals were beyond excellent! She was a valuable source of information and a terrific guide - even coming with us to the market and showing us local places for fresh fish and chicken! The privacy of the Villa was great - not too secluded and in a warm and friendly neighbourhood where we felt very safe and welcome. The views are beyond words - absolutely amazing! We spent most of our time relaxing around the pools and enjoying the warm weather. We did venture out a couple of times with Tyrone - another wonderful tour guide! Tyrone was the driver that was arranged by the Villa to take us to and from the airport and we were able to book him for other transportation needs. He was a wonderful source of history and full of interesting details about the Island. Seacruise Villa is the perfect place to spend a family vacation or a friend's getaway! The owners - Dorothy and Hugh - take your comfort very seriously. Dorothy was a tremendous help in answering all of my questions prior to booking and was there to greet us when we arrived. She checked during our stay to make sure all was well and called us to wish us a safe trip home on our last day. Barbados is a beautiful place to visit and staying at Seacruise will only enhance your stay!! We highly recommend it! Seacruise villa is situated on the north-west coast of Barbados, 3 miles from the historic town, Speightstown. The quiet, secluded Fryers Well beach is good for swimming, snorkeling or just sunbathing. Other Activities: Many sightseeing activities are nearby - Animal Flower Cave, Harrisons Cave, Wild Life Reserve, Flower Forest, Orchid World,Andromeda Gardens.